The studio behind this year’s reincarnation of demonic space shooter DOOM are doing a runthrough of the single-player campaign RIGHT NOW (depending on when you are reading this). Will DOOM make it into our best FPS games on PC hall of fame? 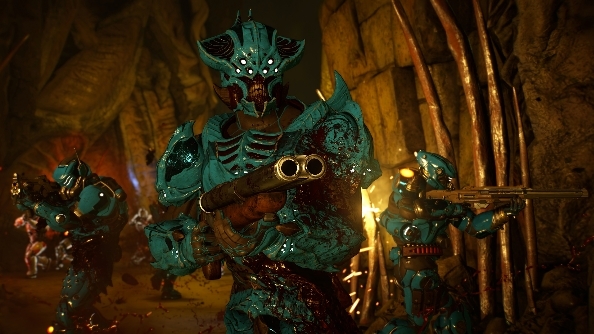 If you, like us, are in the temporal sphere of Wednesday April 27, and it is 11am Pacific Time then id Software are running through the gameplay from DOOM’s hitherto unseen single-player mode on Twitch. If you are not, you can now see the VOD here. Gameplay starts at 15 minutes in and begins with the second level of the game while Executive Producer Marty Stratton and Creative Director Hugo Martin talk you through some of the design decisions. After seeing the multiplayer in action first hand a few weeks back, we had a few questions for the offline version which will hopefully be answered before release. Have a click through to the VOD to see for yourself, and if it piqued your interest then there’s only a couple more weeks to wait as DOOM releases on May 13.